Ready for Chen Village training in USA? 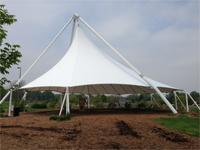 Chen Hui Xian will be back in Madison June 5th – June 7th, 2015 for workshops under the magnificent Agora Pavillion. Pre-register to save $25. In this workshop, Chen Huixian will be reviewing Chen Taijiquan Fundamentals, with a focus on the Chen family method of Silk Reeling exercises and Zhan Zhuang standing meditation and strength training. In Taijiquan, Silk Reeling Exercises is a series of easily learned, repetitive movements that integrate all three planes of motion into smooth, continuous, and controlled weight shifts, core rotations, and spiral movements through the legs, torso, arms, and hands. These exercises help you maximize your body’s efficiency of motion by promoting correct body alignment and energy flow. This workshop will also cover how to maintain the proper body requirements of Chen Taijiquan allowing you to more effectively train your body and develop a higher level of skill not just in Taijiquan, but in other sports and activities as well. *This workshop is ideal for any level of student, from beginner to advanced. New for 2015! A whole day of push hands drills. Last year we had a half day session and you wanted more. You got it! Chen Huixian will be teaching Chen Taijiquan Push Hands training techniques. These are partner exercises that bridge the gap between Taijiquan forms and combat / self-defense applications. These exercises are performed with both fixed and moving steps, focusing on “listening”, “yielding”, and “sticking” skills, as well as maintaining correct Taijiquan movement principle when interacting with an opponent / partner. Ms. Chen and her husband will demonstrate the 5 levels of Chen Style Push hands. Participants with learn and have the opportunity to practice levels 1-3 and possibly more if time allows. Suitable for everyone. Contact Patrick with questions. *There will be a 2-hour lunch break from 12:00pm – 2:00pm. Participants needs to be familiar with this form. You do not need to know the entire form but at least 2/3 of it is sufficient. In workshop, Chen Huixian will be reviewing the 74-posture Old Frame First Routine, also known as “Lao Jia Yi Lu”. 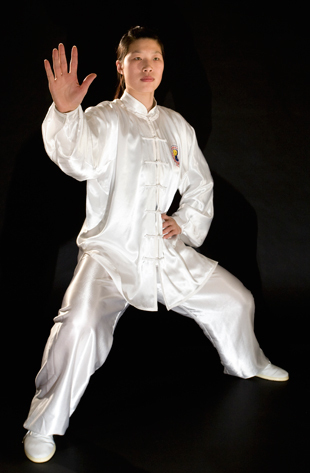 This form is the mother of Taijiquan as most other styles trace their roots to it. Lao Jia Yi Lu is an excellent starting form, usually performed slowly by beginners and is designed to promote concentration, condition the body and acquaint students with the Taiji principles of movement and body mechanics. These principles and mechanics lend themselves to improvement not just in Chen Taijiquan, but also for other styles of Taiji, martial arts, or even sports training.